Born and raised in Edinboro, Pennsylvania, Attorney Jeffrey Kubiak earned his Bachelor’s Degree in Business Marketing with a minor in Business Administration from Slippery Rock University. After attending the University of Pittsburgh School of Law, he received his Juris Doctor degree in 2013. 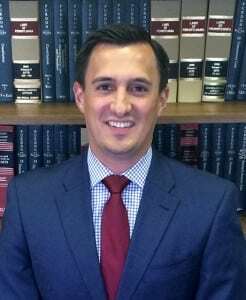 While in law school, Mr. Kubiak interned with Pennsylvania’s Department of Environmental Protection and the Honorable Arthur J. Schwab, District Judge for the United States District Court for the Western District of Pennsylvania. He also interned with the firm. At the University of Pittsburgh School of Law, he was heavily involved in the school’s Health Law clinic, handling guardianship petitions and Social Security Disability appeals. In 2013, Mr. Kubiak joined Nicholas, Perot, Smith, Koehler & Wall. He was admitted to the Pennsylvania bar in 2013, and to the United States District Court for the Western District of Pennsylvania. He is also a member of the Erie County Bar Association. Attorney Kubiak primarily practices in motor vehicle accident and premise liability litigation, workers’ compensation, and Social Security Disability appeals.